For over 100 years the "SPIRIT" of Mission has touched the lives of so many students and families with the generous donations made by family and friends. Your donation to our school can truly "Make A Difference" in the lives of current and prospective students. The students and staff at Mission Elementary School invite you, our family, friends, donors, alumni, and alumni families, to visit our campus and see all the things that are new at our school. Our doors at Mission are always open and we hope to see you soon. 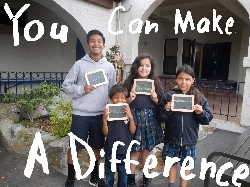 Click on the DONATE button to share a gift to San Gabriel Mission Elementary School. We are a non-profit 501(c)3 organization and any donation made is tax deductible to the full extent of the law. For any questions regarding gifts please contact the Office of Development at 626-281-2454.